I went into Detective Pikachu with less-than-high expectations. It looked cute, but I feared this title would amount to little more than a mish-mash of minigames cobbled together by something resembling a plot. I have to say that I was pleasantly surprised by the entire package presented by this Game Freak offshoot and thoroughly enjoyed the experience, from humor to plot to looks. Detective Pikachu opens when you, Tim Goodman, arrive in Rhyme City looking for clues as to the whereabouts of your missing father. A chance encounter has you crossing paths with a tough-talking, deerstalker-wearing, coffee-loving Pikachu who fancies himself a detective and just so happens to have been your father’s partner Pokémon. Together, you’ll embark on a journey of discovery, investigating strange incidents across Rhyme City, slinking through the runes of abandoned theme parks, sneaking into heavily guarded warehouses, and even sailing on luxury cruise liners as you retrace your father’s footsteps, researching the last case he was on before his disappearance: a mysterious substance known as R.
This game is story-driven and feels very much like a Telltale Games title. When you’re not mashing the A button frantically or timing your presses to catch a falling Pikachu, you’ll be wandering around surprisingly beautiful maps and chatting up people and Pokémon alike, as you gather information, sniff out clues, interrogate witnesses, and piece together mysteries both big and small. The Pokémon around Rhyme City have been losing control with increasing frequency, causing damage to property and danger to people and other Pokémon alike, so you’ll have an ever-expanding number of incidents to look into. The cases around many of these violent Pokémon outbursts have either gone cold or been written off by the Rhyme City police, and there seem to be no leads around your father’s disappearance, but fortunately you’ve got a secret weapon when it comes to uncovering information: your Pokémon partner. You and you alone are able to understand Pikachu, and the little yellow detective is more than willing to interpret what other Pokémon are saying, providing you with important eyewitnesses, clues, and information which other investigators may have missed. The game features nine chapters, each focused around a different case, with each case consisting of multiple smaller sub-cases. Tim keeps an easily accessible notebook filled with very detailed Case Lists, containing evidence, testimony, and everything else you’ve uncovered. Once you’ve gathered all the information you need, you’ll head to your Case Notes, where Pikachu will hash out the details of the case and prompt you with questions which need to be answered. You’ll respond his questions by dragging the correct bit of evidence or testimony into blank squares, thus deducing the correct answer, solving the case, and progressing to the next chapter. This mechanic works fine most of the time, though if you have even a little Pokémon knowledge, you’ll often know the correct answer long before Tim and Pikachu, leaving you to run back and forth trying to drag out the right bit of dialogue to convince Pikachu to move the case forward, but the developers managed to space things out enough so that this never felt overly tedious. On a few occasions, I found myself unsure which clue Pikachu was prompting me to provide, but overall the gameplay was quite enjoyable. I genuinely enjoyed this title, and I threw a Jigglypuff-style fit when I realized that one of my favorite characters was likely a bad guy. While the alleged mystery behind Tim’s talking Pikachu becomes rather obvious early on, it doesn’t detract from the game itself. It can easily be beaten in 10 to 12 hours of gameplay, though it offers some replayability in the form of a host of mini cutscenes which cannot all be unlocked in a single playthrough. Alternatively, you can just buy the Detective Pikachu Amiibo and tap that to unlock and watch any scenes you missed. While the ending wasn’t as fulfilling as I’d hoped, it does leave the door open for Detective Pikachu 2, something I am already looking forward to. The real magic of Detective Pikachu is the Pikachu itself. The gruff voice coming out of that adorable red-cheeked face may take a moment to get used to, but it quickly stole my heart. It looks right, it moves right, it’s sarcastic and gruff at the right times, caring and insightful at others. I could (and may already have) spend hours watching the Pika Prompts in the menu, a collection of the various mini cut scenes where Pikachu attempts to use his moves, gives tips on being a detective, and waxes poetic about coffee beans, among other things. The timing, voice acting, and animation are all on point, and they really set the stage for this little electric rodent to steal the show. 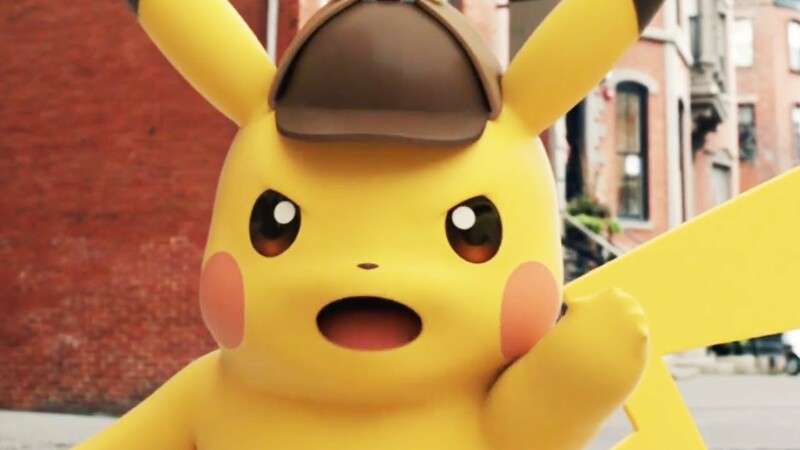 Detective Pikachu is a surprisingly charming Telltale-like game filled with humor, twists, and a sassy electric rodent. More than a mish-mash of minigames, it's a shockingly solid title with first-class voice acting. It's got a Pikachu in a deerstalker! !